This is the biggest cake I've made in a while. So big that I was too scared to transport it in the car over to my Mum's for her birthday. Although it now gives me the perfect excuse to buy another cake box especially for 3-tier cakes. Lakeland, I'm coming for you! 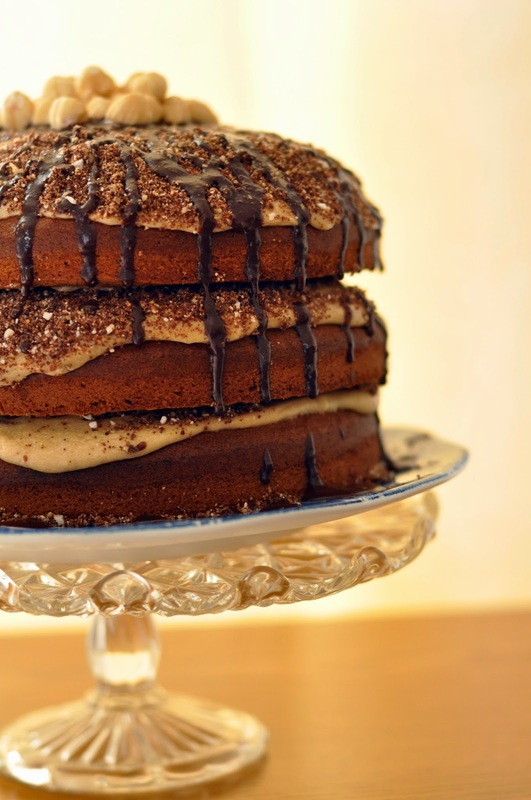 This cake is perfect for special occasions, a chocolate hazelnut sponge, amaretto coffee buttercream, chocolate meringue sand and a drizzle of chocolate ganache to finish. 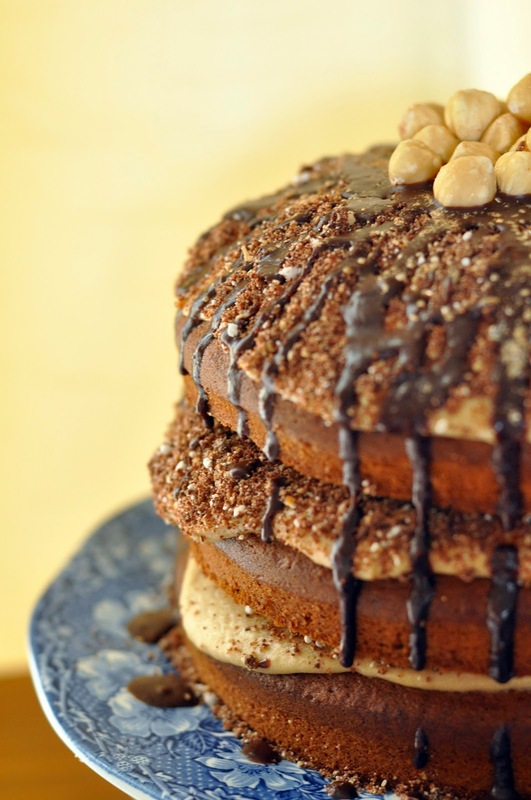 I adapted the recipe from What Katie Ate's 'coffee hazelnut frangelico cake' recipe. Substituting the frangelico for amaretto and the chocolate buttercream for some coffee buttercream I had leftover from another cake. Each of the elements are optional if you wanted to save some time, but as Katie mentions, the time it takes is absolutely worth it. Katie's recipe is so well written and easy to follow,which can be found here. When it comes to baking, there really is no substitute for real butter. Although I often find that to save on time I'll use a form of margarine to be able to bake straight from the fridge. For this cake, I tried out Lurpak's baking butter. Blended with vegetable oil it's ready to use straight away. Definitely worth keeping some stored away as it gives the soft texture of margarine without loosing the buttery goodness. Holy cow, your blog is not for those of us on diets. I am salivating! Your goodies look so yummy and your photography is great.